Franco Nero and George Hilton star in this Spaghetti Western an early film from Lucio Fulci. Italian R2 Eagle Pictures DVD. Infamous in the 1980s for his gory horror films, in 1966 Lucio Fulci was just another director with a few sucessful comedies on his CV. Meanwhile the Spaghetti Western had exploded onto European screens thanks to Sergio Leone, and every producer was seizing the opportunity to cash in, with any director available roped in to helm the films. Tom Corbett (Franco Nero) is panning for gold when he receives a message from his hometown insisting on his immediate return. He travels back to the old family ranch, only to find that it has been taken over by a Mr. Scott. He eventually tracks his brother Jeff (George Hilton) down, to a small shack. Scott owns everything in the town, and his men take a brutal attitude to the townspeople, and in particular, Jeff. Tom sets out to confront Scott, but finds himself at the brutal mercy of his son 'Junior'. Writer Ferdinando de Leo was to become quite a major figure in Euro-cult cinema, particularly during the Euro-crime boom of the early 1970s. The story here is a very typical Old West tale of family revenge, but de Leo and Fulci fill it with a rather unexpected brutality thats sets it above the plethora of mid-card Euro-Westerns that followed. A murder in the town street early on in the film is met, not with gunfire, but with a shocked silence for almost a minute. A savage whipping, and the murder of a family later on, help to keep the tone very grim. There is an attempt to lighten the mood with a stereotype Chinese man, who is annoying enough to have ruined the film, but fortunately he only crops up a few times. The film builds up to a rather inevitable and cliché shootout climax, and the ending does seem rather sudden, but the pacing of the film is generally strong throughout and it certainly never drags. It often seems that Franco Nero was born in a Stetson, although this is only his second Spaghetti Western turn, after Django (1966), while George Hilton makes his genre debut. They both perform strongly, with some good interaction, and Hilton gives a very good turn as a drunk. There are not many familiar faces here, but some generally good performances, particularly from Nino Castelnuovo (who resembles a young Oliver Reed) as Junior. 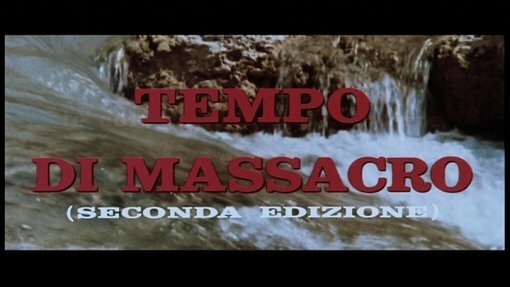 With some unexpectedly savage brutality, Massacre Time stands above the mid-card of Spaghetti Westerns, but lacks the originality to rank among the genre's best. It therefore comes partly recommended to genre fans who have already explored the better known titles. As a Lucio Fulci film, it is one of his earliest titles available, and does contain some interesting hints of the future, and I would say it is of interest to those who want to see what Fulci had to offer before his horror phase. Anyone famous in it? Franco Nero - best known as Django (1966), he later went on to star in Fulci's White Fang (1973). George Hilton - a popular euro-cult star who later played in many comedy Westerns and Giallo films. Any gore/violence? Quite a lot of blood, a vicious whipping scene. One for Fulci and Spaghetti Western fans, but both will find better places to start. A below average print with some very noticable fading and a lack of contrast - some scenes look sepia tinted. Fortunately print damage is minimal, and the film is generally watchable. The transfer is good with no digital artifacting. Audio Italian 5.1 remix and original mono. English mono. The Italian audio sounds sharper, English is a little muffled with some hisses and pops, but dialogue comes through fine. Photo gallery, plus poster, video and soundtrack cover art. Short biographies of Nero, Hilton and Fulci, in Italian. Other regions? The only other official release is an R2 Japanese disc, although this is non-anamorphic and has no extras, but might have better picture quality. German and American released bootlegs have generally poorer image quality. Note: the presence of "Second Edition" on the title card, has lead some to suggest that this is a re-edit of the film, although there is no confirmation of this, and it might just relate to the Italian dub track. A rather cliché story is joined by some surprising brutality and solid direction, plus two good performances. Partly recommended. Picture and audio quality are poor, but the film is watchable, and it does come with a fold-out poster. Hopefully this film will get a fully restored release one day, but until then, this is probably the best way to see it. Find our other Franco Nero, Lucio Fulci and Spaghetti Western DVD Reviews.